When you are above a certain pace, every batsman is a bit wary of you. People get out of the line. My oldest memory of cricket is playing on the back lawn with my brother. I don't know why we were a sporting family, but cricket was always No. 1. We used to have our Test matches, and you have got the tree stump as the wicket, and all your flowers fielding for you. The big thing was to be Bradman. My brother always wanted to be Bradman. Grey High was a good school. Incredible school. The front field is called the Pollock Field, named after my brother. I still love to sit down and watch the cricket. I turn the commentary off. Do you know why? Because I think the commentators today have become public-relations officers. They are all being paid by someone to promote the game. If they were honest, at least someone would say that T20 is becoming boring, but they can't do that. There is too much money involved. But it is getting boring. I am sick of the ball going out of the ground. To play for South Africa and beat Australia and England, preferably in Australia and England - that was my dream. I always thought that the English thought they knew everything about cricket. Best thing - beat them in England, and then they can't complain about the umpires. 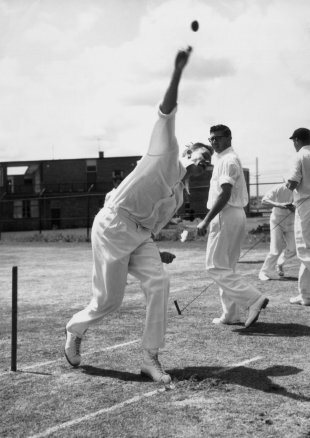 In the days before neutral umpires, they always complained about the umpires, and probably with justification. Money is stronger than politics. They are probably intertwined, but money is stronger. Don't tell me it's not the same in football. Graeme was three years younger than me. To get him to play, I used to have to let him bat first. Then he used to get in, I would get him out, and he would say it wasn't out, and I would say it was out. Then we would get my mother to come in. "Oh shame, he is small, give him another chance." That would happen a few more times. The next time I got him out and he wouldn't go, I would give him a club or something. So that also finished the game. I often joke about that, saying that's how I became the bowler and he the batsman. Time actually proves good techniques do work. Fast bowling was always my thing. From a young age, I always was faster than anyone, and I always bowled these big awayswingers. It was always considered the prize ball. Our actions revolved around outswingers. I don't think modern cricket has gone forward. It has gone different. Guys can come and bowl for hours outside the off stump, and sooner or later somebody will have a go. You can bowl halfway down the track, and everybody is going to hook and they are going to send it up sooner than later. Nobody can control it up there. Some do it better than others, but sooner or later somebody is going to send it up. Man, use your nut, leave it alone. The guy is going to stop sooner or later. I was an opening bat through my junior school and senior school, and my brother, when he came first to the Grey team, he batted 8 or 9. He started off as a seamer, and then he bowled legbreaks. But around standard eight or nine, things started to change. In a way I always knew. At 11 he made his first hundred. What can you say of the sanctions? In my book I said Graeme and I would have been better had we been born in Adelaide. We happened to have been born in South Africa. The Pollocks were always very anti-apartheid, always on the outside. If we were living today, it would have been better. Because you can have Mugabe as head of your country and still play Test cricket. I have a problem with people that need to be motivated. Successful sportsmen are self-motivated. I believed I could do it in my first Test. We beat New Zealand, and I got nine in the Test. I just wanted the opportunity. "Your job in five or six overs was to get a wicket. Your job wasn't to keep the runs down or to bowl a line"
My brother will tell you he didn't think that running round the field helped his batting. I would very much disagree with him. He didn't like running singles. He only hit boundaries. I think if he ran a three, you would notice that he would take his gloves off and sort of have sweat jumping in front of his eyes. My dad and mother were both good sportsmen. My dad had played hockey and cricket. He was tough. We were brought up in the days when parents were strict. The one thing he really disliked was if he ever thought we got very big for our boots - if you made a hundred and gloated about it. I thank god for that. We lived in a day and age where that sort of modesty was not just encouraged but was virtually insisted upon, expected. A guy could come in there and stand. I could look at him taking his stance and guard, I could tell certain things about him from how he stood and how he held his bat. "Pooch" actually started when I first played for Eastern Province. I was still young, and my voice hadn't yet broken properly. And I would say "Howzat" in a squeaky voice. A guy called Atholl McKinnon, a big, burly left-arm spinner, and he called me Pooch because it sounded like a dog yelping. And then along came my brother and they had Big Dog and Little Dog. Pooch became Putch, it became two dogs, putch, hoot, schweiner, my brother was called Schweiner. Later he became Schweiny. The genuine awayswing comes from your body action. What I call swing is late swing. It's coming, coming, and then it goes. The guy who swings right from the arm, you can pick. Doesn't bother good batsmen. The swing should be late. I used to train with weights. I used to run round and round at the race course. I was a fitness fanatic. I realised as a fast bowler you had to train like an athlete. Most cricketers in my day were very unfit. Trent Bridge was special because we beat England. Always loved to beat England, for some rhyme or reason. I was a journalist and then in the business world. I never earned any money from cricket. My dad was a newspaper editor. He was one of those editors who were anti-apartheid. We had a lot to say, but we never got personal. That's what is bad now. They are far more personal. The Aussies started it. It wasn't good. Eddie Barlow started the deep point. He was the first guy who used to do this. In 1961-62, they thought: "Look at him!" We give far too much credence to sportsmen and what they think. I remember Alf Gover did a whole study. The whole issue of pace is in the hip. You look at all the top pacemen, the hip comes through first. The hip comes through at the point of delivery. He always maintained that the genuine fast bowlers, the classic old action, the hip had to come through. The hip came through and left the body behind, and it's there that the pace comes. You can't coach that. George Cox, who was a coach at Grey High, said two things. "Graeme, leave him alone. Peter, leave him alone. That run-up suits him. He is comfortable." One-day cricket, you can't win them all. You might even lose to weaker teams. Not so much in Tests. Ntini, Gibbs and Adams can know that when I was convenor of selectors they were picked in the team not because they were non-white. They could put their jackets on with pride knowing that they were picked because I thought they were the best. In the days before helmets, very few people hooked. The only people who attempted the hook were good hookers. They didn't have helmets on, they knew it was dangerous. It was funny, even as kids we always said we will play one day against England and Australia. It was never "if". It was always: "One day we are going to play cricket." One day. At school we always played in the Grey first team, and the Grey first team played in the men's first league. We were playing in the men's first league at the age of 13-14. Any of the modern cricketers writing books, I wouldn't bother reading. I can honestly say that I could never give back to cricket what it gave to me. And it was not money at all. A platform, what it has done for Graeme and I and Shaun, you can't get it anywhere. Money can't buy that. I dreamt of the day that I came in to bat, 90,000 people at MCG, and my country needs three runs to win, and I go and get them. Trent Bridge still goes down because my brother got a hundred and a fifty. I got ten. He got one wicket, which made it 11. I got a 30 or whatever. We scored 200 runs and took 11 wickets. 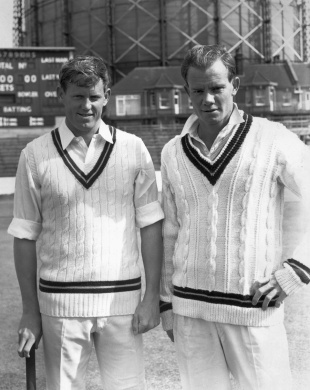 I think it still goes down as best combined brother contribution - batting and bowling - in any Test match. Did the sanctions work? Were we justified in doing it or not? South African history is a mish-mash. There's no question apartheid was absolute inequality. We were very opposed to it. In the process a lot of people got unfairly hurt and treated. That included white people. It wasn't just the black people. I went into journalism when I left school. That suited me while I played cricket. I wanted to do what Richie Benaud did or Fingleton did. And then isolation knocked us on the head. There was never a jealousy or envy between my brother and I. There was no sort of gross sibling rivalry. I think it would be fair to say that watching him and recognising the talent in him was a motivational factor for me. I just wanted to get there before him. I wanted to play for South Africa before he did. We went through the same channels, the school first team, the South African schools, then provincial side, and then South Africa. I believe that as a fast bowler you were an attacker, so that meant you attacked batsmen and stumps. Your job in five or six overs was to get a wicket. Your job to keep the runs down or to bowl a line. You would have not only slips, you would have a leg gully and a leg slip. We didn't have many people behind the bowler. "Take me to a garden, I can't tell you about flowers and all that stuff. But take me to some cricket match and I will tell you"
At Grey, if they heard Graeme was batting, all the people would come to watch him bat, and they would circle around. If he got out, they all left. I didn't turn pro in England. I couldn't think of anything worse. That meant six months in England. The thought of playing six days a week as a fast bowler in England with those huge footmarks - they didn't fix footmarks as they do today. Of the top 25 batsmen in the history of English cricket, six were in the same team against us. Edrich, Boycott, Dexter, Cowdrey, Barrington and Graveney. All in the same side. You couldn't make money in journalism. I gave up cricket during the boycott. I went into the business world. I got to the top. I was an executive director of a multi-million dollar company by the time I was 40. Then I had this experience that changed my life. And within six years I had given up my fancy job and fancy Mercedes and all that. And I was out. And I have travelled the world ever since, preaching. People watch cricket and think, "Oh, that guy is too young, and we need experience." But when I was first picked I didn't believe I couldn't do the job. Because that's the way you are wired up. Successful sportsmen are like that. My brother never scored a run against me, and I never got him out once. All our lives we were at the same school, we were at the same province, and we played for the same country. I never played against him. I think the thing that really changed South Africa were the sanctions applied by America and Europe on trade. No question that everything finally boiled down to rands. You look at a film like Invictus. A rugby match didn't change South Africa. I know the ANC and all will never be happy with that film, and they weren't. The fact that they portrayed Mandela, they left it alone. But to try and suggest to the ANC that a group of rugby players changed the country… South Africa was throttled economically, and that's what changed the country. There is far more luck involved in the one-day game. That is definitely a problem. If I am a professional sportsman, I won't like that. In many respects why is it that a 50-over game should decide the World Cup anyway? It is only done because of convenience. One-day cricket has more luck involved than Test cricket. That might contribute to what we call choking. I know when Herschelle Gibbs and Jacques Kallis were first picked, both of them started very, very badly. And people said, "Why do you persist with them?" Because I could see. I remember the first time I saw Fanie de Villiers taking deliveries away, I said, "I want him." You can see. Take me to a garden, I can't tell you about flowers and all that stuff. But take me to some cricket match and I will tell you. The three Pollocks. All three, at some stage in their life, were ranked No. 1 in the world. There's no family that has had that. It was just a privilege.